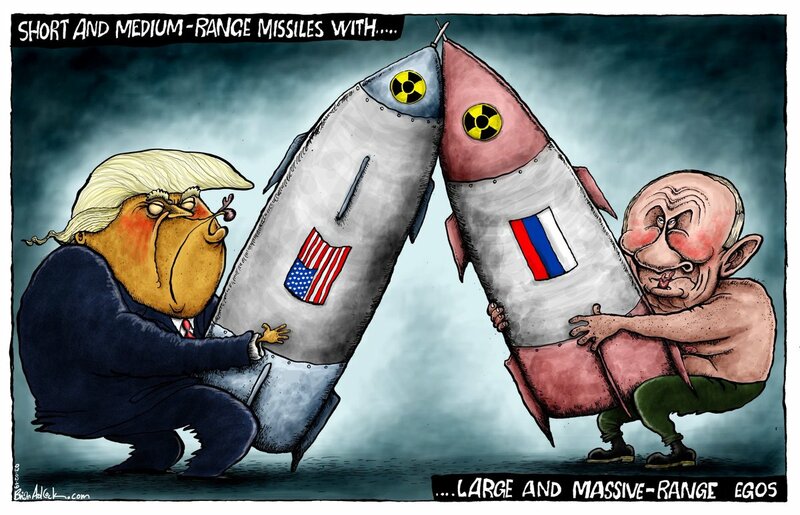 Brian Adcock provides another spin on the same issue, depicting US President Donald Trump and Russian President Vladimir Putin having a clash of their “massive” egos while armed with nuclear missiles. 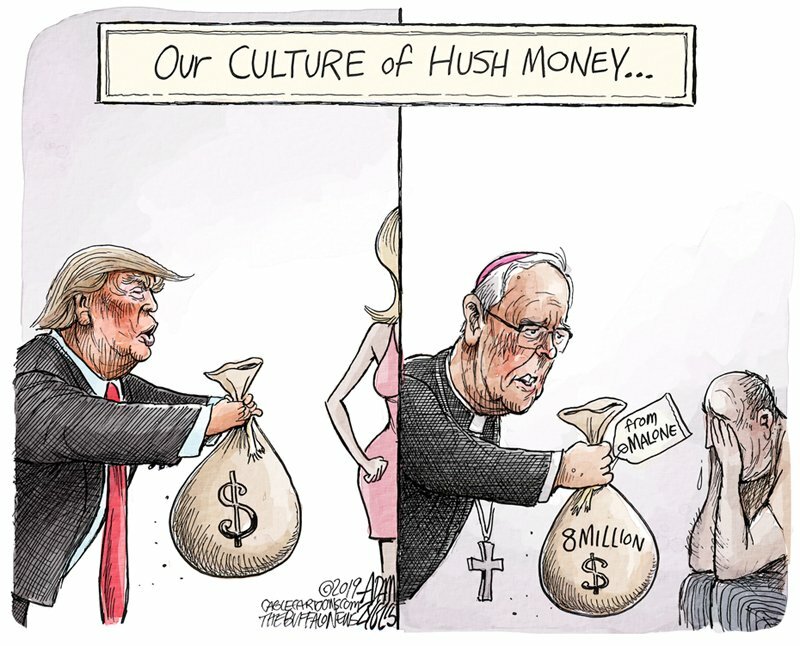 Adam Zyglis shows US President Donald Trump’s ‘hush money settlement’ with pornographic actress Stormy Daniels over their alleged affair and lawsuit. He draws a parallel to Richard Joseph Malone, the Bishop of Buffalo, New York, who has raised money for the victims of sexual abuse in his Diocese. 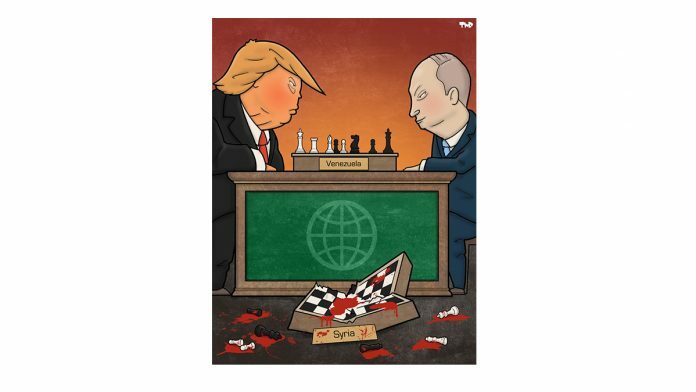 Tjeerd Royaards suggests that the United States and Russia have triggered another proxy war in Venezuela, after the bloodshed in Syria. 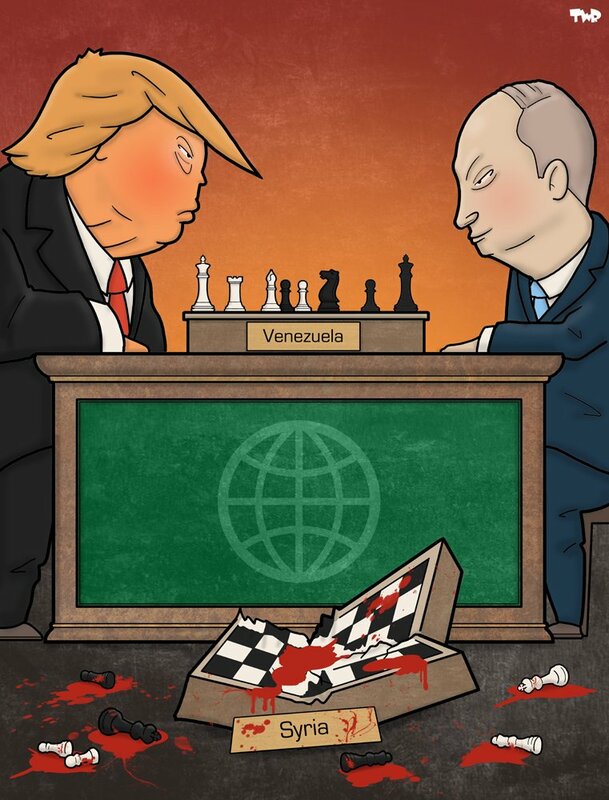 Venezuela is witnessing a political crisis, with US-backed opposition leader Juan Guaido declaring himself president, and incumbent president Nicolas Maduro coming under increasing pressure to step down. Kevin Siers for Politico uses the polar vortex that has brought unprecedented cold winds to America to draw an interesting parallel. 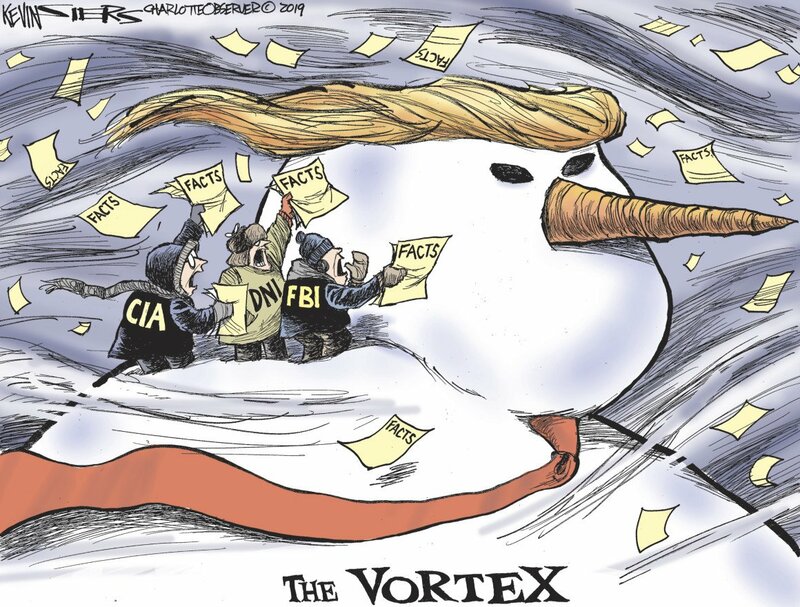 Donald Trump is shown as a giant snowman who is blowing through all the facts gathered by US security agencies like the FBI, CIA and the Director of National Intelligence. 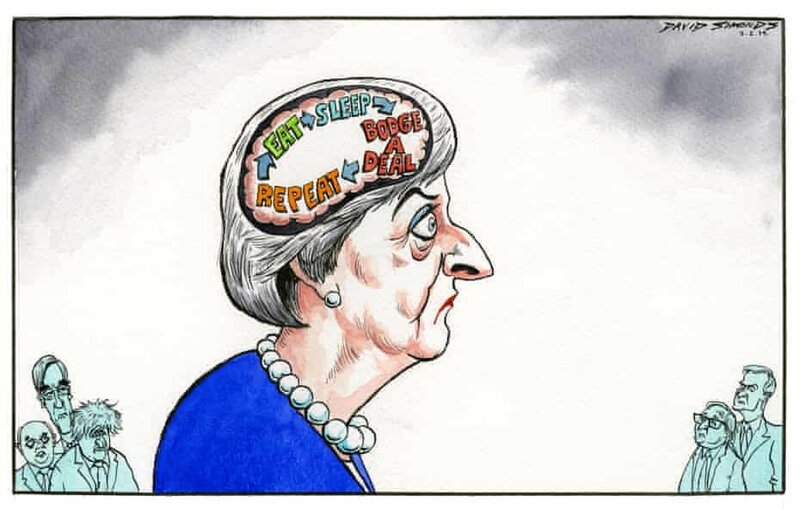 Dave Simonds depicts the inner workings of British Prime Minister Theresa May’s brain, in the context of the botched Brexit plans so far. Andy Davey takes a jibe at May and Jacob Rees-Mogg, chairman of the European Research Group, a body of Conservative Party MPs that are firmly in support of Brexit. 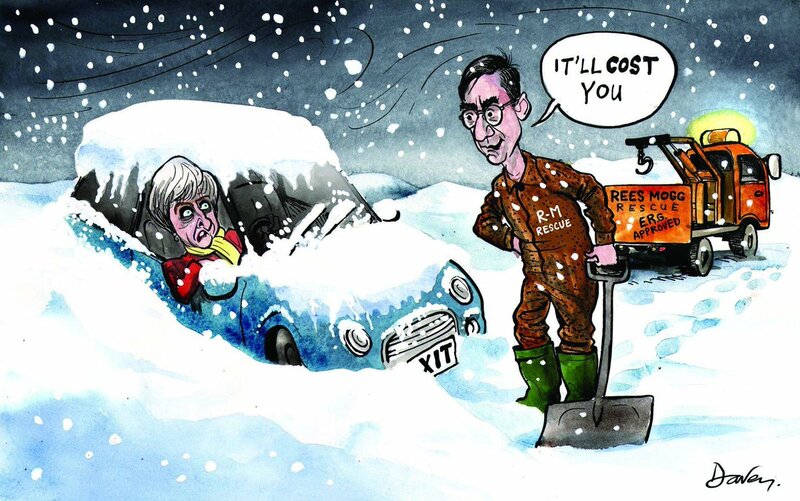 Rees-Mogg is seen offering ‘conditional support’ to the PM if she is willing to renegotiate a deal on the Irish backstop in Brussels.